With most of Asia closed due to the Chinese New Year (many wishes again! ), Japanese was subject to represent the region. The Nikkei 225, dropped 19bps today. German Chancellor Angela Merkel recent trip to Japan highlighted a concern with Huawei that data emanating from the EU must not be handed over to the Chinese government. As Huawei is now the second largest smart phone maker and with global politics being as tense as it currently is, you can see how this could be a potential issue. The Chinese-US trade issue, could be driving significant business to Canada, Europe and Japan if an agreement is not soon rectified. This was written in study composed by the UN. The ASX 200 jumped 2% to 6006, the highest close since October 10th. Indonesia is due to release their GDP YoY figures later this evening. Gold and silver diverged today, with Gold increasing ever so slightly with a 15bp move. Whereas silver decreased 19bps to 15.85. A very positive day for Europe indeed, with the CAC, FTSE 100 and DAX increasing by 1.52%, 2% and 1.67% respectively. Company earnings such as BP helped lead the way. Also upward revisions of the PMI numbers helped the cause. Other regulatory news, smaller firms will not have to clear their derivatives trades under changes to European Union rules agreed by the bloc’s lawmakers and member states. This will make Europe more competitive in nature to the less regulated jurisdictions. An up-and-down day across the major U.S. Indices. Corporate earnings continue, with the market reacting to yesterday’s earnings from Google parent, Alphabet, Inc. The activity in the tech / communications sectors have been driving the markets in the early stages of 2019, and today saw more earnings, led by The Walt Disney Company after the close. 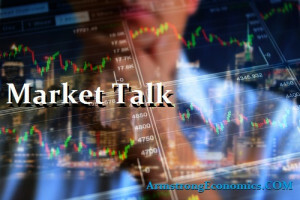 Sentiment around U.S. – China trade talks has been positive, reflecting confidence a deal will be done in spite of any real material progress to report yet, while concerns on Fed policy have eased ahead of tonight’s State of the Union address from President Trump. All said, the Dow closed up another +172.15 (+0.68%); the S&P 500 closed up +12.83 (+0.47%); the NASDAQ Composite closed up +54.55 (+0.74%); and Russell 2k closed up +2.69 (0.18%). Canada’s TSX Composite closed up +100.37 (+0.64%) while Brazil’s BOVESPA closed down -277.44 (-0.28%). Today’s weaker US and UK data and the weight of the global manufacturing industry caused the Oil markets to slip. We are starting to see the volatility as a norm as we have multiple areas of impacts from Venezuela to the Saudi budget. We did however touch 2019 highs yesterday before closing down for the second subsequent day. European government bonds are starting to go negative on the front end with the latest figures showing up to 40% of the government bonds issued are being in negative yield. This is up from a low in 2018 of 33%. Japan -0.01%(+0bp), US 2’s 2.52% (-1bps), US 10’s 2.71%(-2bps), US 30’s 3.02%(-4bps), Bunds 0.17% (-1bp), France 0.58% (-1bp), Italy 2.81% (+6bp), Turkey 14.02% (+10bp), Greece 3.90% (-0bp), Portugal 1.68% (-0bp), Spain 1.26% (+0bp) and UK Gilts 1.23% (-5bp).